When Shirley Allerby was admitted to hospital at the end of last year, her family were told to say their goodbyes. 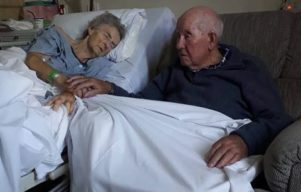 But “miraculously”, Shirley pulled through, and much to her husband Roy’s delight, the couple are on track to celebrate their 70th wedding anniversary in April. Valentine’s Day is next week, and the Midweek reached out to find a couple whose love had stood the test of time. Roy and Shirley’s connection was an evident front-runner from the start. 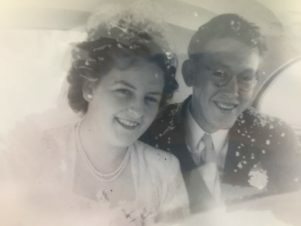 Their granddaughter Kate Riddell, who will be making a replica of the couple’s wedding cake for their upcoming anniversary, nominated her grandparents as a couple we could all learn a thing or two about love from. She told the Midweek that her nan had had a medical event “that we thought she would pass away from”. “My Poppy was devastated and stayed by her side holding her hand. 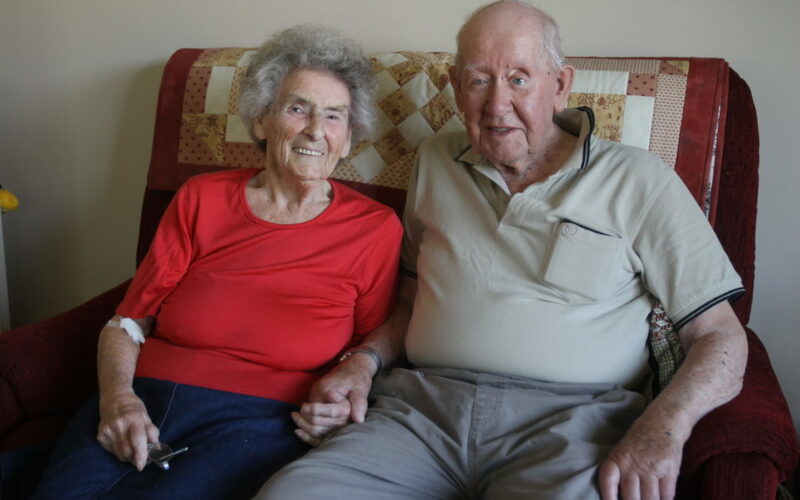 Roy, 92, and Shirley, 89, live in Lansdowne, Masterton, but their story begins in Miramar. “We met in Miramar,” Shirley said. Roy recollected that he had “cottoned on to her” at a dance – “I thought to myself, that’s a gorgeous looking thing – I’ll have her!”. In 1947, the couple were engaged, and two years later, on April 2, 1949, they married at St Aidan’s Church in Miramar. Before that, “she was still in her house, and I was still in mine – you couldn’t live together them days,” Roy said. “No nothing like that went on,” Shirley said. After honeymooning in Palmerston North and Tauranga, the couple settled into married life, later having four children: three daughters, and a son. Their son died at the age of 55 from cancer. As well as children, the couple now have 11 grandchildren, and 15 great-grandchildren – “and another one on the way”. “We’ve been so happy,” Shirley said, “and we have had some lovely times with the family”. “We also love each other very much. As Roy is partially blind, and Shirley uses a walker, the couple don’t go out very often, but say they enjoy sitting on the couch and enjoying each other’s company. “What is the secret to a long happy marriage? I wouldn’t have a clue,” Roy said. “We just like each other’s company. “There have been some financially tough times, but we’ve got through them by banding together. “Oh, and do as you’re told. Shirley’s advice for a healthy relationship was to “not give up too soon on love”. She said she was “really looking forward to” their anniversary which is set to be celebrated at Club Wairarapa among family and friends. At 7pm on Valentine’s Day, February 14, a ladies’ night out will be held at the South Wairarapa Working Men’s Club. This will be a fundraiser for Wellington Free Ambulance and is hosted by the Greytown Lionesses. There will be speakers, displays, raffles, entertainment, and fun to be had. The event costs $20 and tickets are available from South Wairarapa Computer Services in Greytown, Almo’s Books in Carterton, or by contacting Lioness president Helen Gray on (06) 304-9407.